Wat Chedi Luang วัดเจดีย์หลวง is a well known ancient temple located in Chiang Mai town. This temple is a temple where a few great monks of the Thai Forest Tradition have stayed and some managed to accomplished high levels of practice a long time ago. 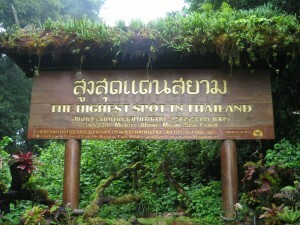 In the olden days, monks who practiced under the Thai forest tradition would go through ascetic practice such as staying at forest/cemeteries/caves, eating one meal a day based on what is obtained during almsround, wearing robes made from cloth that was used to wrap corpse….basically leading a frugal and hard life. 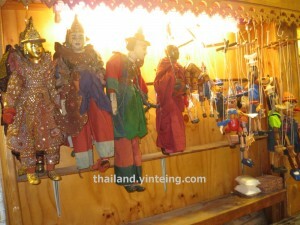 You would see a number of his pictures and sometimes wax figure in various monasteries in Thailand. This is because this master is revered for reviving the practice of Buddha. 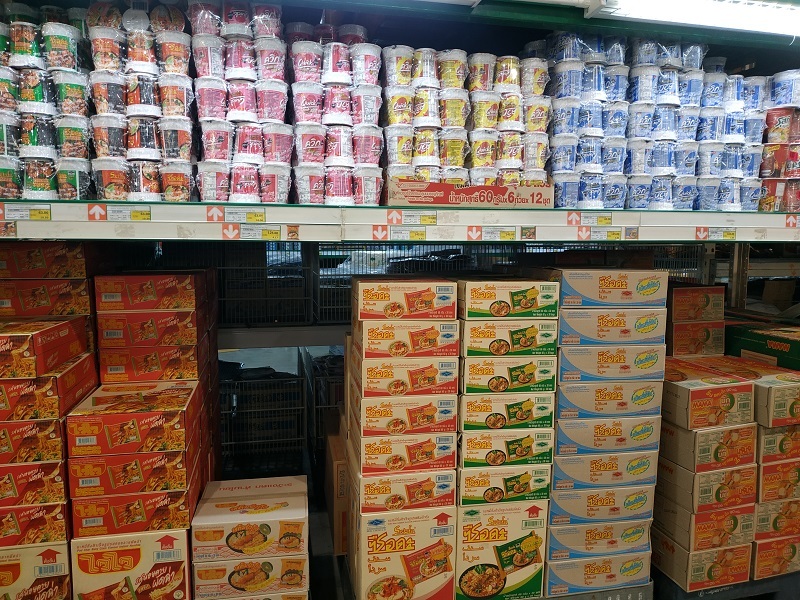 Over the years where Buddhism has entered Thailand, it has already blended with the local customs. 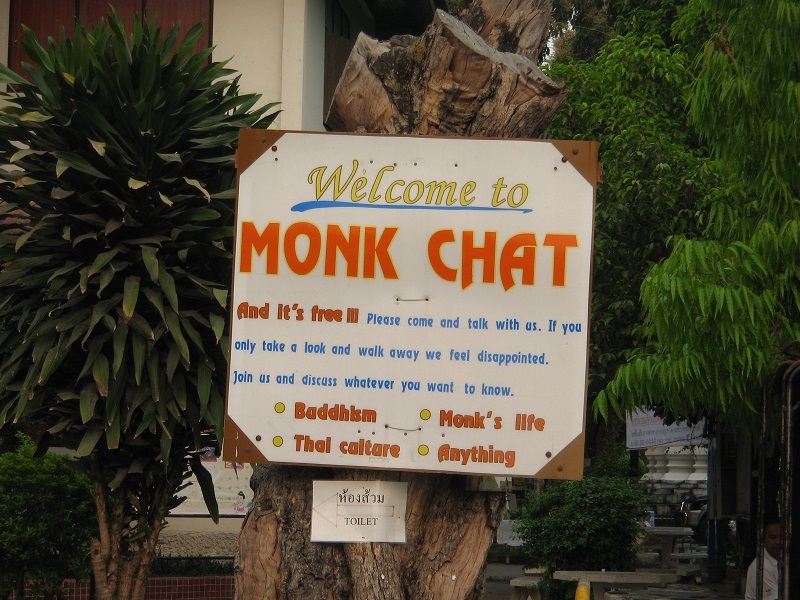 So monks were basically helping villagers and dabbled in things like fortune telling. In about 100 years ago, Ajaan Mun (above) who ordained as a monk felt that to accomplished enlightenment seemed to be out of reach based on what teachings that were available then. He then went back to the scriptures and followed the Buddha’s way of life. He led a very ascetic life and became a highly accomplished master. Ajahn Mun passed away in 1949 at the age of 79. You may read about his spiritual biography in this link. This is one of the books that has changed my life. Ajahn Maha Boowa, borned in 1913 was one of his youngest disciples who practiced with Ajahn Mun during 7 years before Ajahn Mun passed away. Ajahn Maha Boowa was the one who authored the spiritual biography containing about 500 pages of inspirational journey and stories – he wrote the book through going to interview Ajahn Mun’s various disciples over the years. 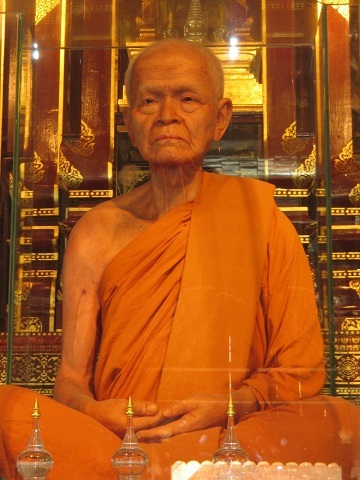 Ajahn Maha Boowa also undergo strict practice and was highly revered in Thailand for his spiritual accomplishment. He led a simple life in the forest monastery of Wat Pa Baan Taad in Udon Thani till his passing in 30 January 2011 at the age of 97. He is one of the longest surviving direct disciple of Ajahn Mun- who spoke and taught the teachings of Thai forest tradition and taught how to practice. He had many Westerners who ordained as monks under him and who translated some of this books that made it possible for the English speaking world to benefit from the teachings. I met him, in person the first time I went to his temple in Udon Thani in 2005. I had gone through a lot of hardship to get there…. and the first time when I met him…. I knew it was all worth it. I am glad I was able to meet him as rather than reading about the teachings, I was able to meet someone who practiced the teachings to heart. The impact is really different. 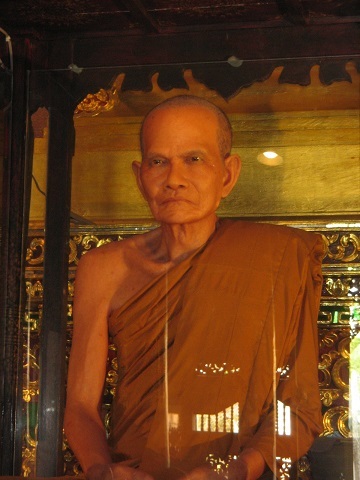 The wax statue of Luangta Maha Bua above was build before his passing away and even when Luangta was alive, his shaved hair had turned into crystals and being displayed near his statue. It houses an old pagoda, dating back to over 600 years and is the tallest in Lan Na Thai kingdom and in Thailand as a whole. It was first constructed in 1391 during the reign of King Saenmuangma (1386- 1401). 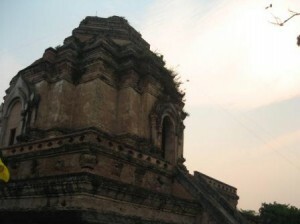 In 1479- 1481 during the reign of Tilokaraja, the 9th monarch of the Mangrai dynasty (1442- 1487), the pagoda was reconstructed and enlarged to 80 metres in height and 56 meters on each side at its base. It was a mixture of Lan Na, Sri Lankan, and Pagan architectural forms. The most important change was an alternation of a niche at the eastern side of the pagoda so as to enshrine the Emerald Buddha. During the 80 years of its presence in Chiang Mai, the statue was kept in grand Vihara one year, and was enshrined in the niche 79 years. In 1512, during the reign of Phra Muangkeo, the 11th monarch of Mangrai dynasty (1495- 1525), renovations were made on the pagoda again by enlarging and strengthening its base and making walled enclosure. Later in 1545, during the reign of Queen Chiraprabha, the 15th monarch of Mangrai dynasty (1545- 1546), there was a heavy rainstorm and an earthquake, which caused the pagoda to topple leaving only half of its structure standing. It was impossible to restore it. it was left in this condition for over 400 years. 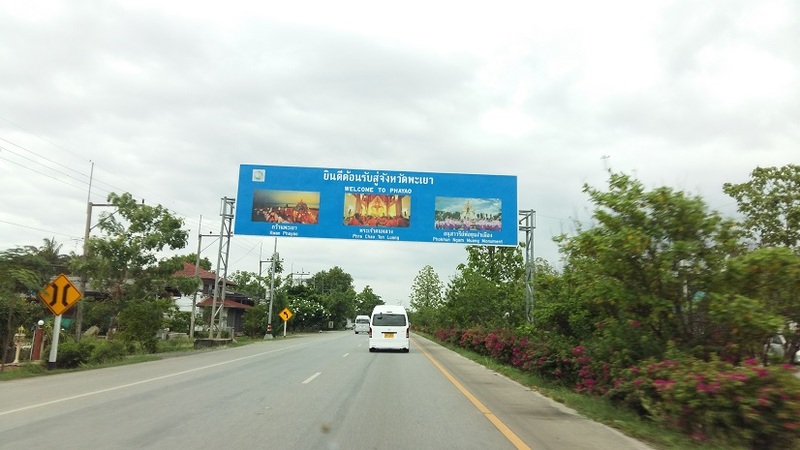 On the 4th of June, 1990 the government allocated a budget of 35,000,000 baht through the Fine Arts Department for restoration of the ruined pagoda. The work was finished in December 30, 1992. The restored pagoda is 60 meters wide at the base (but the real height is not known). In Jinalakamalipakarana (JMK), a Northern Thai Chronicle, translated by Saeng Manavidhura from Pali into Thai, printed on April 25, 1958 relates about grand pagoda thus: “In Culasankaraja 689 (B.E 1871) Phra Chao Saenbhu founded Chiang Saen. Four years later he constructed Mahavihara in the center of Chiang Sean” (JMK 1958: 104). The so-called Vihara meant the Wat and the first grand pagoda at Wat Phra Chao Tonluang, Muang Chiang Saen, the capital of the Yonaka kingdom. 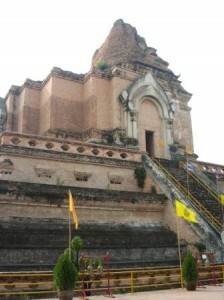 “Phra Chao Phayu was born in Culasakaraja 687 (B.E 1869). At the age of 12, he ascended the throne and resided in the Yonaka state for 3 years, then moved once again to Chiang Mai, a city founded by King Mangrai, which was 2000 meters long and 1800 meters wide; a city moat of 18 meters wide was dug, brick walls were constructed and King Phayu had a central pagoda constructed in the heart of the city about 76 Sok (cubics) in height with a 48 Sok wide base (JMK 1958: 104). 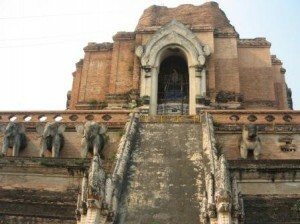 These two central pagodas were located at Wat Jotikaram or Wat Chedi Luang, which was situated in the center of Chiang Mai city, the capital of Lan Na Thai Kingdom. When King Saenmuangma was 39 years old and had ruled for 16 years, he started the construction of the grand pagoda in the heart of the city. While construction was going on, he passed away. His queen had the pinnacle of the pagoda finished”. (JMK 1958: 16). The grand pagoda was completed (King Tilokaraya rebuilt it taller and bigger) had only one pinnacle. It was 52 Sok wide on each side at the base and 92 Sok high. A flower stand was made 57 Sok long and 2 Sok high. Laterite walls were made on four sides (in order to protect the pagoda), measuring 228 Sok Long and 150 Sok wide” (JMK: 1958: 120). “In 1512 the king (Phra Muangkeo) together with his people made a silver enclosure around the grand pagoda. There were three rings of walls made of 254 kilograms of silver. 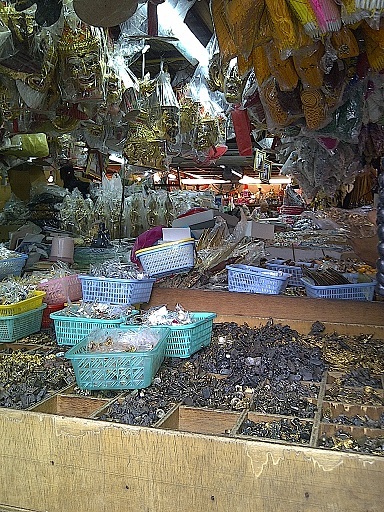 That amount of silver was later exchanged for 30 kilograms of gold, which was coverted into plate in order to cover the pagoda. A new addition plus the original golden cover plates totals 2,382,517 kilograms of gold” (JMK 1958: 134). Phra Muangkeo is a great grandchild of King Tilokaraja; Tilokaraja is a grandchild of King Saenmuangma: Saenmuangma is a grandchild of King Phayu; Phayu is a grandchild of King Saenbhu. These five kings belong to the Mangrai dynasty. All of them took part in the construction and renovation of those two grand pagodas. They were direct great grandchildren, grandchildren, and grandfathers of one another. Inside the monastery compound, in addition to the grand pagoda, there are two minor pagodas, standing near the front of the Vihara on the northern and southern sides. Both pagodas were built a long time ago, but no date is known. The are the same size and shape, with redented square bases; their bodies are bell-shaped and covered with metal plates gilded golden leaves. At the base they measure 6.95 meters wide and 15.88 meters high.